Gamification is a key decider in the success of any mobile app. The regularity of your user’s interaction with your app determines how well-built it is. However, getting your customers to engage with your app regularly is not so straightforward, as users nowadays, especially millennials, have a low attention span, and they tend to lose interest easily, It is not enough that your app brings value to the customer, it will be abandoned if the user does not find it interesting enough. This is where gamification can help you out. Gamifying apps is a strategy that has been proven to help motivate users to engage with an app more often. It keeps them interested and excited. Example of gamification: A fitness training app that allows users to share their weight loss statistics on the social media with friends. This strategy serves as an incentive for the user to engage with that app more, as they would be motivated to share success stories with friends, or even compete with them by swapping scores. The strenuous process of getting fit becomes fun. This is how gamification works! Now, what is the best way to gamify your app to boost customer engagement? 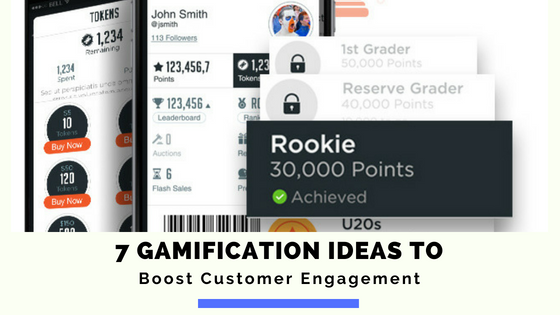 There are a lot of ideas, and some of them are niche-specific, but for the purpose of this article, we have compiled a list of seven gamification ideas with brief explanations for your perusal. The idea behind this is simple. Say, you own a mobile app for an online/physical store, you can start a contest by hiding a product within the app and telling customers to look for that product. You could offer a product discount for whoever finds it. This strategy is sure to get a lot of users clicking away on your app, as everyone struggles to be the one to get the discount. Because if you run these sort of campaigns at regular intervals, it will increase your customer engagement substantial, as your users will get into the habit of scrolling through the app, looking for something or the other. This basically suggests that you keep track of the customers that are engaging with your gamified app the most, and encourage them by occasionally giving out loyalty rewards. The form that these rewards would take would depend on what your app is about, but it should be something related to your business. This is another great way to get customers to engage with your app. When you run polls on topics related to your app occasionally, users are bound to check them out, out of a willingness to participate or out of curiosity about the opinions of other people. For example, a soccer app runs a poll comparing two famous players, soccer lovers are bound to flock to the app to vote or check out what people are saying about the polls. A sure-fire way to lose a customer’s interest in your app is by making your troubleshooting section difficult to understand. You could make a fun, interactive quiz session to identify the customer’s problem and guide them through a solution. This is not the same as loyalty rewards, although they are similar. While loyalty rewards are targeted at giving loyal customers gifts, loyalty recognition comes in a different, more competitive form. You could set up a leader-board on your app, listing the most loyal users by rankings or points. This acts as an incentive for the most active customers, and they struggle to stay atop of other users. It’s great to have new users, but keeping the old ones happy is even more important. Running flash Sales at regular, unannounced intervals will also help you to improve customer engagement. Best way to improve customer engagement within your gamified app is a link up with social media. Most importantly make it possible for users to share data from your app to their social media, and conversely, you should also run social media accounts to promote your app. Most people that have a smartphone to run your app will have social media accounts, and so, integrating both platforms is bound to increase customer engagement. Looking to build a gamified version of your app to improve customer engagement? Gomeeki has the mobile solutions that you need. Our team of mobile app developers is wonderfully knowledgeable about gamified apps. We are quite certain that we can find a strategic match for you. A great example of a properly gamified or Fan engagement app is the FanTribe app that we built for modern sports fans. In the next blog post, we will discuss the gamification of education and how gamification will help you enhance learning experiences. Talk to us today, and let us help you find your own fit!